Besides their use for various musical reasons, octaves shapes on the guitar can be a great help in learning the names of the notes on the neck. Especially on the 4th, 3rd and 2nd strings...which tend to get neglected. Often guitar players learn the names of the notes on the 5th and 6th strings first before learning the other strings. That's because those 2 strings are needed as key reference points for different common barre chords and basic guitar scales. But after taking the time to learn the 5th and 6th strings the 4th, 3rd and 2nd strings tend to become a dark blank area on the neck. In this guitar lesson I'm going to show you an easy trick so you can get to know the names of the notes in that blank zone easily. What about the 1st string? Well the names of the notes on the 1st string are the same as the 6th string. So that is easy enough. If you don't already know the names of the notes on the 5th and 6th strings, have no fear. 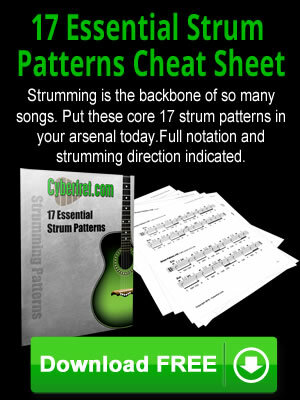 You can learn them in the Learning the Notes on the Neck of the Guitar lesson right here on Cyberfret.com. This is prerequisite to making use of this guitar lesson, so take a moment to review if you are a little rusty. Octa is the Greek prefix for eight. An octave is a note that is 8 steps above (or below) a given note in a major scale. A C major scale mad up of the notes from C to C with no sharps or flats. From C to C is an octave. If I give each note in the scale a number... the first C is 1, and then when we reach C again, that is 8...the octave. Here's how that translates into a basic C major scale on the neck of the guitar. So the 1st octave shape to learn comes right out of that basic major scale form above. This octave shape is most commonly played with your 1st finger on the 6th string, and then your 4th finger on the 4th string 2 frets higher. You could also play this with your 1st and 3rd fingers, but it's just a little more of a stretch. Again there are a lot of musical reasons to use octaves, but at the moment we are only going to use this shape as a crutch to help find the names of the notes on the 4th string. So if I want to know where an A note is on the 4th string, first find an A on the 6th string. Then go 2 frets higher on the 4th string. So A is on the 6th string 5th fret, and A on the 4th string is at the 7th fret. The next octave shape is really the same shape we used above. But now we're going to use the notes on the 5th string as a reference to find the notes on the 3rd string. So if you are trying to find a D note on the 3rd string, first locate it on the 5th string. They go 2 frets higher on the 3rd string. So a D note is on the 5th fret of the 5th string, and on the 7th fret of the 3rd string. To find the names of the notes on the 2nd string we have a new octave shape to learn. For this octave shape you will play a note on the 5th string with your 3rd finger, then the note on the 2nd string will be 2 frets lower on the neck with your 1st finger. So just like finding the name of the note on the 3rd strings, you are going to use the 5th strings as your reference. But this time with a different octave shape. So if you are trying to find a D note on the 2nd string, first find a D on the 5th string. D is on the 5th string 5th fret, and on the 2nd string 3rd fret. You really only need the basic shapes we have already covered to easily find the names of the notes on the 4th, 3rd and 2nd strings. But if you are looking for some extra credit, here are all of the basic octave shape...and how you could use them to find different notes on the neck. Used for finding notes on the 4th string, from the 6th string. Used for finding notes on the 3rd string, from the 5th string. Not as common for finding note names, but very common shape musically. Used for finding notes on the 4th string, from the 1st string. Used for finding notes on the 3rd string, from the 1st string.